The Grouped Remote Nuclear Reprocessing Plant (GRNR Plant) is a new-age nuclear plant that implements Archimedes Filter Technology, UREX processing facility, and a Traveling Wave Reactor into one unit under one roof. Every part of the plant is connected through methods of remote handling. The addition of every portion of the plant in one concentric area promotes the ability to foster a Nuclear Community that handles all aspects of nuclear energy in one consolidated location. Our closed system provides a greater sense of security to a reactor site by cutting down on the need for the transportation of radioactive products and raw nuclear materials. The close proximity of the on-site facilities allows for the ability to keep all materials under the close supervision of a security staff. Our plant is most cost effective than of its predecessors. The GRNR Plant maximizes the efficiency of the production of nuclear energy. The system takes unwanted spent fuel from existing nuclear reactor and converts it into productive fuel to power a traveling wave reactor, or any other type of micro-reactors. Therefore the GRNR Plant acts as a recycling center for not only itself, but for other nearby nuclear sites as it generates its own nuclear power. We aspire for our GRNR Plant to become the prototype for future nuclear power plant designs. 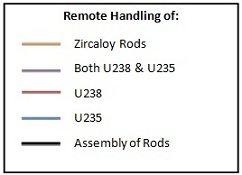 Remote handling will move nuclear material both between and within our four major plant facilities as shown in the diagram below. Our remote handling unit will be a programmable, fully-automated robotic system. It will be comprised of a series of servo manipulators, automated conveyor belts and an operator-based CPU. I did have an idea, combining the Archimedes Filter Plant (AFP) with the fast neutron reactor farm you have been working on. In one of the links you sent me were the Oak Ridge proposals for the Remote Handling (RH) system and equipment for operating, maintaining, and repairing the AFP. At some point, the enriched and separated fuels from the AFP process will need to be transferred from the AFP to the fast reactors. The Oak Ridge abstract is a pretty complete picture of what is necessary to handle the hazardous waste and extracted fuels, but it doesn’t address how the fuels get to or into the fast reactors. ... you could work up a product which remotely and safely transfers the enriched fuels directly to the fast reactors during their manufacturing phase, with a plant at the same site. The main GRNR Plant is divided into four facilities that carry out its main functions. The Processing Facility acts as the entrance point into our cycle which supplies materials for the other steps in our plant: Archimedes, Manufacturing, and New Reactors. A cyclical nature is generated in the plant as used materials from new reactors are fed back into the processing facility. This ability allows us to more efficiently gather and reharness the resources in spent nuclear fuel and reduces the need to transport or store it at other facilities. The Processing Facility is the first stage of the GRNR Plant. This portion of the plant separates the desired uranium from the spent nuclear fuel from already existing nuclear reactors. The processing site uses UREX processing technology, a liquid-based extraction method utilizing acetohydroxamic acid. The inputs from the existing reactors are immediately loaded onto the pallet conveyor belts by an overhead crane to be taken to the Processing facility for the uranium extraction through methods of UREX processing. Uranium, separated from the extraneous materials, is gathered by a series of servo manipulators to be loaded onto the pallet conveyor belts to be taken to the Archimedes Filter Plant facility. The AFP Facility is implemented in stage 2 of the GRNR plant. By utilizing the Archimedes filter technology this facility is designed to separate specific ions from the nuclear waste. Once at the AFP facility an overhead crane, with the assistance of servo manipulators, loads the uranium into the designated input port. The Archimedes filter is tuned to have a mass cut-off between 235U and 238U. Once the Archimedes Filter System has separated the enriched uranium-235 from the depleted uranium-238 the two are removed from the Archimedes Filter through a vacuum system and pumped to the Manufacturing Facility. The AFP Facility will also receive another set of "liquid slurry-type" waste from the Processing Facility. This waste will be removed by an overhead crane and placed into a separate Archimedes Filter Plant that contains an array of mass filters. This allows specific ions to be removed by sending the waste through two filters, one with a cut-off value below the ion’s mass and one with a value above the desired mass. Any waste that is still will then be recycled through the two filters again until all of the useful ions have been removed. By starting with the lowest mass ion desired you can always send the ions below that mass to the Storage Branch as undesireable waste. To commence stage 3, the Manufacturing Facility would receive depleted 238U along with an independent stream of 235U in a caustic melt fromm the Archimedes facility. These materials would travel between facilities via vacuum pumps. 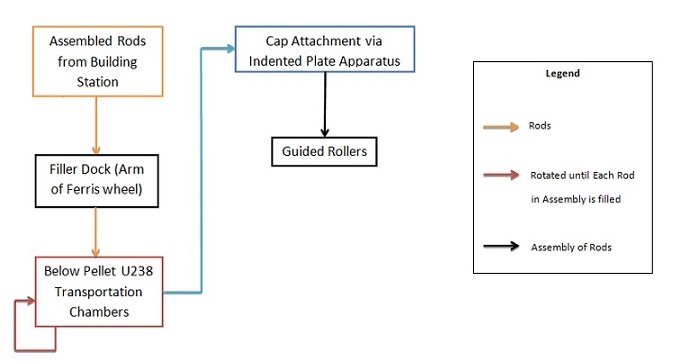 The two elements will be carried to separate locations to undergo preparation to become fuel rods; one station where pellets will be formed and distributed to hollow rods and the other, where the TWR starter caps will be produced. Once the molten 238U reaches its destination, it will be formed into hexagonal pellets. Through a process called injection molding, the molten 238U is formed into hexagonal fuel pellets. This will be done by injecting the 238U into a clamped device so it forms the material into a hexagonal prism shape when fully occupying its shell. The material inside the clamp is then cooled and ejected into transportation chambers that move the pellets to a nearby grinding station to ensure uniformity in pellet dimensions. After pellets are ground into identical sizes the transportation chambers expand to discharge the pellets into zircaloy rods which have been imported into the facility. The zircaloy rods represent containers with flat sealed bottoms and open tops. They are preassembled into their bundles before being brought to collect the pellets from the grinding discharge station. The first degree of rotation of a mechanism grabs the bundles of empty rods and positions it underneath the discharging chambers with the open top face-up in a similar fashion to a Ferris wheel. As one rod is filled the mechanism’s second degree of rotation horizontally rotates the bundle so that the empty rods are sequentially filled to their maximum capacity. Once each of the rods in the bundle has been filled, the first degree of rotation of the mechanism brings the bundle to an angle where the cap is attached. While the pellets were being formed from 238U, the cap for each rod has been simultaneously created out of the 235U. Like the pellets, the caps will be injection molded to the shape of a hexagonal prism. Each 235U prism is expelled by its clamp into specific spots on a plate with indentations of the same configuration as the bundle of rods. Fitting pieces for the rods’ cap attachments are preplaced in these indentations. After a plate has been filled it is loaded onto a 3rd-class lever apparatus. The bundles rotating about the filler mechanism are gathered so that they will be lined up to match the pattern of the indentations on the cap plate. The lever then rotates to stamp the caps into the rods. The fuel bundles continue to rotate via the filler mechanism until they reach the bottom of the cycle where they are released back down to a series of guided rollers that deposit them to a place where a crane relocates and organizes bundles. The bundles are collectively packaged and remotely moved to the New Reactor Facility through a series of conveyor belts. The New Reactor Facility is designated as stage 4 of our plant. Once the completed rod bundles have left the Manufacturing Facility along the conveyor belt and reached the Traveling Wave Reactor Facility a group of servo manipulators will take the rod bundles from the conveyor belt and load them into the Reactor. After the TWR has completed a cycle the excess waste is harvested from the spent fuel rods and put onto the conveyor belt to be taken to the Processing Facility to re-enter or continue the GRNR Plant cycle. The GRNR Plant is able to have multiple additional branches to attract a wide variety of companies to use the plant to fit their individualized needs. The branches are optional add-ons to the GRNR Plant; these branches have a modular nature that gives the ability for each branch to be plugged in as needed. Branches allow for companies to cut down on transportation costs by keeping all aspects of their energy and some of their raw material needs on site. 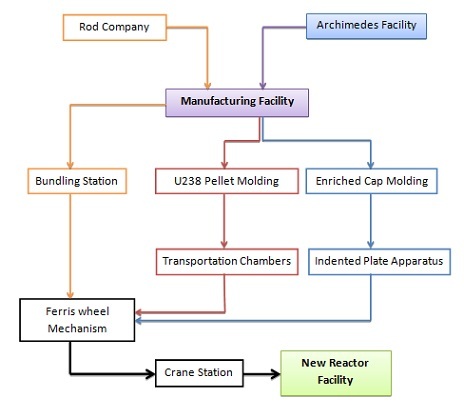 Possible branches include the Existing Reactor Branch, the High Level Waste Branch, the Low Activity Waste Branch, and the Storage Branch. Other branches could be attached to our community based on the resources provided by our plant and the needs of the company. Additional branches could be medicinal companies that supply scanning materials, cancer treatment centers, or a manufacturer of atomic/nuclear batteries. 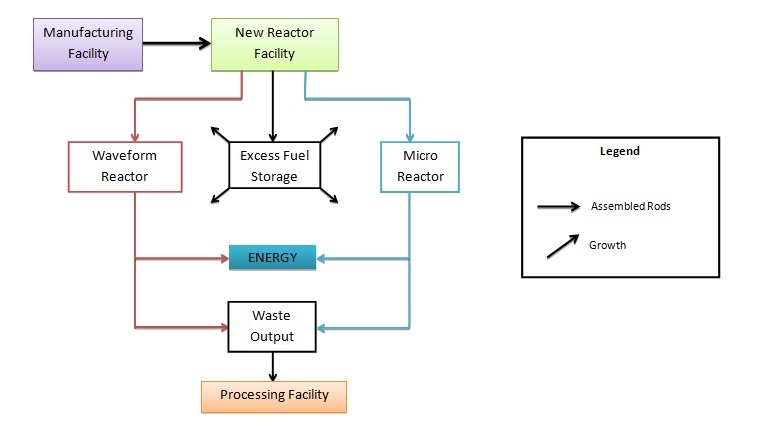 The Existing Reactor Branch ultimately is an addition to the GRNR cycle through a reactor that already exists. Our plant could be built on the same site as this reactor and would feed off the waste generated by this reactor. The Existing Facility provides pre-constructed storage and cooling facilities for our plant. The Existing Facility can be phased out over time to help bring current reactors into the future. High Level Waste materials, such as Strontium 90 or any other useful beta emitters, could be exported to a company to create atomic batteries, medical materials, or any other uses that are developed in the future. The High Level Waste branch could be either exported or a company could add themselves into the system. Lower Activity Waste would be sent to one of two places. The first and most likely recipient of the Lower Activity Waste would be a LAW vitrification plant, which would process the waste. If at a later time a company finds use for the Lower Activity Waste, that company could be added to the system. When the Archimedes Facility finishes processing the nuclear waste, some of the waste is not useable. As a result, the waste must be stored in dry cask storage. I see it as the final piece of to the nuclear cycle: nuclear generation by large reactor, waste disposal, recycling of separated waste products, and regeneration of power using the by-products of nuclear waste. The concept is adding this last piece on-site to share facilities and equipment. The product is an on-site manufacturing facility that processes and converts nuclear waste (Archimedes), turns it into useable fuel, completes construction of fast reactors, and installs them on-site or ships them out to end user customers.